South Korean food giant Nongshim will release a new non-fried type variant of its best-selling instant noodle brand Shin Ramyun, its latest effort to refresh its product line and cater to more health-conscious consumers. The new ‘Shin Ramyun Dried Noodle’ is scheduled to hit the shelves on Saturday, the company said. This is the second variant of its flagship noodle brand after the launch of Shin Ramyun Black in 2011. What makes the new brand different is the method of drying the noodles. Most instant noodles are deep fried in oil for a longer shelf life, a process that generates a lot of fat. But because Shin Ramyun Dried Noodle is not fried, its calories have been reduced to 350 kilocalories, about 30 percent less than conventional noodles. To preserve Shin Ramyun’s signature taste, the company said it changed the composition of the soup and upped the ratio of shiitake mushrooms. 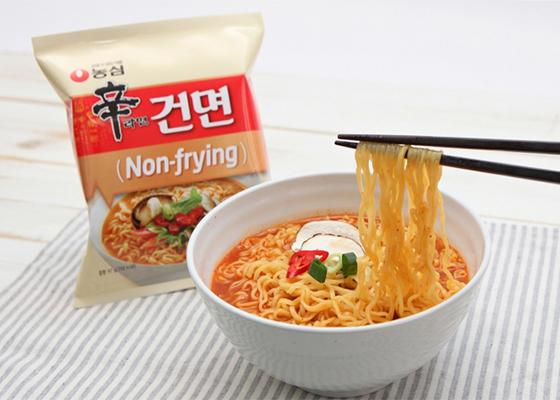 Nongshim has a number of non-fried dried noodles under its portfolio, including Doongji Cold Noodle, Jang Kalguksu and Dried Noodle Shrimp Soup. But changing the noodles for the Shin Ramyun brand was an especially daunting task, the company said, as it had to come up with a healthier option while maintaining the brand’s satisfying spice and unique flavor. Created in 1986, Shin Ramyun has remained the top-selling instant noodle brand in Korea since 1991, with cumulative sales reaching 31 billion units as of late 2018. Thanks to its successful launch in the U.S., the brand generated 317.1 billion won ($282.1 million) in global sales last year.